Smoking ban? What smoking ban? Well, I had to do something creative after shifting so much snow. John le Carré falls flat? Three weeks ago I wrote (here) that I was reading ‘Our Kind of Traitor’. I have just managed to finish it (it was very put-downable and I found plenty of other things to do). For me it was a huge disappointment. I found the ending VERY predictable and completely lacking in originality. The whole book seems to have an air of so-whatness about it; there was the occasional flash of the old le Carré brilliance, but only for several pages in the last quarter of the book). Sad, but I won’t be buying any more. As I said in my B&Q rant, it’s my money. As in the case of B&Q’s poor service, I do not intend to subsidise writers that are past their best. Cruel? I don’t think so. Remember that expression, ‘quit while you are ahead’? It applies to everyone. BUT… I won’t be going back to the Beano because there must be some good books out there. How many do I have to buy before I get one that I really can’t put down? Am I really that fussy? Hope not. I may even have to buy some of the books recommended by Scott Pack (see blogroll links to the right>>>). It’s about time I accepted that winter is here, sort out some warm clothes to wear and stop pretending I’m hard like those Scots that wear kilts – or shorts – all year round (I am not a Scot anyway, and these days I only bare my legs in public if I feel threatened). It was my first (and only) encounter with studded tyres. He went on to tell me that the hard-packed snow on the road was about 30cm thick, that the highway authorities scrape the surface to keep it flat but they don’t grit or salt the roads. Once the temperature falls it tends to stay low and the snow stays frozen. Ours does not. Hence our grit and salt. Not all cars I saw had studded tyres, most had chains (but it was some time ago and I suspect things have changed). I have driven with chains on all four wheels (I had a jeep) and could plough through two feet of snow. Trouble was, when I got onto cleared, salted roads it was like driving with tank tracks, marking the road surface and cutting my tyres. The other problem was that it makes no difference how macho your vehicle is, if the guy in front of you is blocking the road there isn’t anywhere else you can go. B&Q: just not good enough, guys! I have spent thousands of pounds in various B&Q shops in the last few years. Now, when I go in to any of my regional stores (there are several), I have no idea whether or not there will be any staff at the checkouts. Today I was forced to take a trolley-load of goodies to the self-checkout, those hateful devices that I have vowed never to use because their sole purpose is to reduce the number of checkout staff and thereby swell profits. They are also hateful because the chance of them working properly (judging by the number of flashing red lights and garbled orders from the machines’ speakers), must be close to zero – as is the customer satisfaction. It’s not that B&Q is short of staff, because if all the checkouts are all closed then chances are you will find them elsewhere in the store in a management huddle, oblivious of the dozen or so customers at the self-checkouts (some with trolleys heaped high) struggling to buy their goods. Believe me, I am no technophobe (see my other blog posts if you dare). I refuse to use the self-checkouts because I believe that if I have chosen a particular shop then it is not simply because of the reasonable cost and the extensive range of goods, it is also for the standard of service. I do not get any service at all from a machine! All I get is to be told that the item I have just scanned must be put on the scales. Really? Why should I have to lift all the heavy items out of my trolley? And why does it want to weigh a saw? I suppose I should be grateful that it didn’t ask me to count the number of saw teeth. Am I going to read a list of instructions on a screen so I can correct my (more likely the machine’s) little mistake? No bloody way! YOU ARE ABOUT TO TAKE MY MONEY, folks, so do it with a bit more style! Don’t give me pain, because it’s my money and you want it. I am willing to exchange it for goods in your shop, but only if you are nice to me. If not, I will buy my goods elsewhere. And that is what I shall do, because from now on, Mr B and Mr Q, I shall be frequenting my local Homebase. They may not sell the range of goods you sell, but until you have at least one checkout open at all times I shall simply abandon my trolley-load of stuff in the aisle and go elsewhere – and don’t tell me the self-checkouts are there for my convenience, or they are there to speed-up buying (because judging by the frustrated, embarassed, angry customers I see, that is rubbish). Provided there are no more than about four customers in front of me I am perfectly happy to queue. If you think this is a one-off, Mr B and Mr Q, then think again. It has been going on for months now, at all stores I visit. I have spoken to other customers and they are really pst off with your system and your closed checkouts. Am I bovvered about all this*? You bet I am! Ah, you say, but you are only one customer. You might spend thousands of pounds, but we take millions. BUT Mr B and Mr Q, 200 readers read my blog yesterday…. And Tesco and Sainsbury – in case you are listening – don’t bother to encourage your staff beckon me towards those infernal machines in your shops either, because I won’t go. I know what happened to those ancient mariners. * click here (then go to CT). Yesterday evening I went to see (hear?) 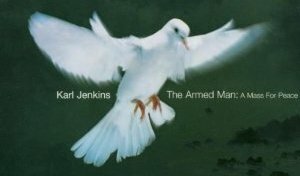 a performance of composer Karl Jenkins’ ‘The Armed Man: A Mass for Peace’, performed by the Edinburgh University Music Society. It is a particular favourite of mine. I have a CD of the National Youth Choir’s recording from 2001, though I have never heard it live. The Armed Man has been described as a dark piece. Black, more like. In my mind the only thing that comes near it in terms of darkness is Rachmaninof’s ‘Isle of the Dead’, not something you want to listen to when you are feeling depressed. Jenkins’ piece is very different in that there is hope. It is a Millennium composition, a vain hope that after thousand years of hellish war there can be a thousand years of peace. Enough… back to the performance before I get shunted off to pseud’s corner in Private Eye. Am I allowed to say brilliant? To be honest, I went along to St.Cuthbert’s in the city (our city, not London) with the expectation that the performance wouldn’t match that of my CD (well, you do, don’t you, especially when it’s the National Youth Orchestra). I was VERY wrong. The EUMS choir (and small orchestra – I’m sure there is a name for a small orchestra, but I’m no musician so I don’t know) was stunningly good. The conductor, Neil Metcalf, was a dream. If anyone ever tells you it’s the choir or the orchestra that makes a performance then ignore them. Stop being their friend. How anyone can do that stuff in a suit and a collar and tie* completely escapes me. The Armed Man has amazingly abrupt terminations, stops and starts, like following too close to a learner-driver. There was nothing learner-driver about Metcalf. I’m not sure that I have ever heard a choir (and I have heard a lot of choirs) cut and start as if the power had gone off and then on again. If any member of the audience got bored with the piece (never!) then they only needed to watch Neil. Again, Brilliant – choir, conductor and orchestra! It was touch-and-go whether or not we should go. We had other things to do, or other things we could have done. You understand me. You know what I mean. But I love The Armed Man, it plummets me to earth like nothing else does. It was my birthday treat… no, you don’t want to know… or, rather, I don’t want you to. I remember from somewhere that The Armed Man of this piece is not a guy with a gun but an Arm’d Man. So, for Arm’d Man, read man wearing armour. *I have just been told that he wasn’t wearing a tie. The tram project looks horribly dead to me, especially the tram on show in Princes Street which stands silent and unlit, unheated and unattended. If a tram could die, this is what it would look like. Over the years I have been involved with some large construction projects, two or three of which would dwarf the Edinburgh Tram Project. What always puzzles me is that it seems to come as a surprise to everyone involved (except the contractor, presumably) that major projects often end up costing several times the initial estimate – ten times in the case of the Scottish Parliament building*. The MD of a UK national construction company once told me that all contractors bid well under what they believe the project will cost because ‘if the true cost was admitted beforehand, large engineering jobs would never get off the ground’. He said that all companies did that and bidding was a case of the least costly (technically sound but still unrealistically low priced) bid getting the work. He also told me that one construction company in particular (still around and NOT one of those involved with the tram project), employed more people in their claims department than in their engineering department, their job being to explore for loopholes in the contract so they could actually pull a contract round into profitability. I’m not grumpy, honest. Well, not much. I am consoling myself with the thought that he doesn’t quite understand what grumpy means and that he really meant ‘gruff’. I wish…. I might have to work on my voice. Grumpy, gruff or grumbly won’t do, so I might have to raise the pitch, perhaps to falsetto. How about this? One of the disadvantages of living out of town is that we get power cuts, especially when there are high winds. We used to get so many that soon after moving here I bought an emergency generator. It has proved a very good buy, I have to run it four or five times a year and it powers the freezer, the fridge and the central heating. It also powers the TV, computers and the lights, but not all at once. Switching on the kettle, the shower or the immersion brings the generator to a sudden, juddering halt. Having to use it brings home to me how dependent we have become on mains electricity, and how much we actually use. The generator gobbles up petrol and only provides about one-fifth of the peak power we need. 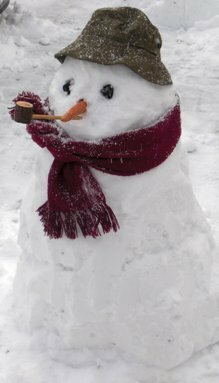 Last year, when we had three feet of snow and no electricity, I had it running for five days, during which time it used around eight gallons of petrol (work out the cost yourself – there are 4.5 litres in a gallon). I am no stranger to generators. Years ago I worked on the test bed of a well known manufacturer of diesel engines. I tested big diesels by connecting each one to a dynamo about the size of a small car. By measuring the output of the dynamo I calculated the power of the engine, its fuel consumption and efficiency. It’s no big deal, it’s done every day by makers of engines. To start everything up there was a large steel switchbox with a handle that I moved from OFF to FULL slowly and gradually. It was old, the kind of switch mad scientists use to energise Frankenstein’s monster. I’d never had trouble with these switches before. They were solidly built, with thick copper bars leading into them (protected by metal guards) and heavy cables leading from them, under the concrete floor to the dynamo. The morning everything went wrong I was eating a sandwich. The engine, the kind of diesel fitted to tugboats and naval launches, sat ready to run, oiled-up and with its injectors primed. Breakfast sandwich in one hand and switch lever in the other, I eased on the power. The dynamo hummed and turned slowly, turning over the engine that was coupled to it (the engine had no starter motor and this was the way to start it). The engine spluttered, started, and ran quickly up to full speed – time for me to release the switch handle and return it to OFF, except that this time it wouldn’t move, it wouldn’t go forwards or back. About five seconds later, molten copper started to drip from the switch and splash on the floor. The busbars (the heavy copper strips leading into the switch) sagged and melted – and copper melts at 1083ºC. It was awesome. There must have been a lot of smoke because the driver of the overhead crane trundled along to me and threw down a fire extinguisher. It didn’t work. The other two extinguishers I brought to bear on what was now a red-hot switchbox and smouldering surroundings didn’t work either. There were flames, though I’m not sure what from. Burning paint, perhaps. We didn’t manage to find out what caused this little mishap. There wasn’t much left to examine. I have the greatest respect for electricity, and I have what might be considered by some to be a fetish for fire extinguishers. I have one in my car and about five in my house. There is also one within easy reach of my little generator when it is running. There is something Fred Flintstone about what I saw in Dobbies, Dunfermline, today. I’ve put it on utube, here. Though if I remember rightly, Fred had proper wheels on his car. Steam, at 9am yesterday morning. 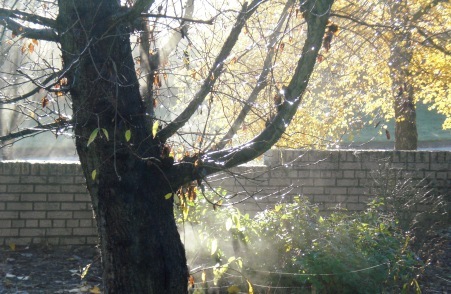 Temperature 2ºC, the sun comes up and there’s steam blowing everywhere, like walking past the railway shunting yards when I was a boy. So what? I hear you say. The difference between this and the usual drifting mist is that this was fast-moving, almost billowing out from trees and hedges. Then, several hours later, a flurry of snow, the first of the year. Last week I noticed that Schiehallion had a dusting of snow and Ben Lawers, in the distance behind it (and 131m higher) was brilliant white. Like my ceilings. So, it’s cold – no big deal. This is Scotland and we are well into November. I’m going to miss wearing short-sleeves and my summer Craghopper trousers with pockets for everything. Where am I going to keep my camera? More importantly, where am I going to keep my writing notebook?